I am cycling from Mexico to Patagonia, the southern most part of South America. 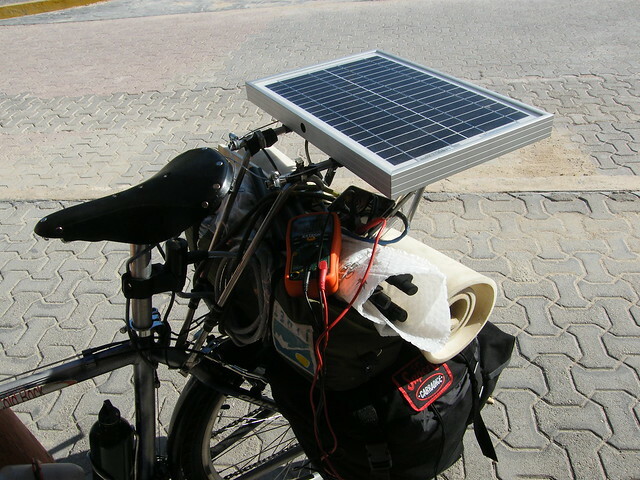 I have fitted the bike with a solar panel, and am adding more electronic gadgets as I travel. I started my trip on 10th of December 2012 and have no plans about when it will finish. This is an introduction to what I am doing and why. There is a standard life pattern that where I’m people are expected to follow. School, university, job. Buy house and car. Work most of life. Retire. Die. Is this the best way to be happy? I’m pretty sure it’s not. Do you need to stay in one place? 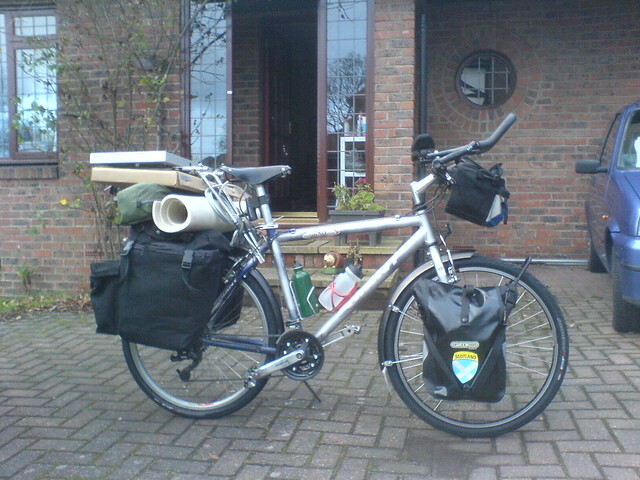 What are good forms of transport for a nomadic life? What makes me happy. What could make everyone happy? What is needed to allow more or even most people to be nomadic? What could be done to make travellers lives easier? For example, I think more community workshops, for bikes, electronics and other things, would help. The bicycle as a practical means of transport - not just a toy. Thought, and rational behaviour. I would like more people to think about how they are living their lives - analyse them. Is what you are doing really what is best for you, or are you doing what you have been told to do by society, even though it’s making you miserable? How many people do you see smiling in the morning on their way to work? It doesn’t need to be like that. After failing to get a lift across the Atlantic in a yacht last year, I still wanted to go to Patagonia. In December I wanted to escape the Scottish winter to somewhere warm. I knew there was going to be a Rainbow Gathering in Palenque, Mexico, near a Mayan ruin site, around the time of the end of the cycle of the Mayan Calendar. This, the climate and a very cheap flight to Cancun came together to give me the start point of Palenque, at the End of the World. Now I am heading down to another end. I don’t suppose the exact location really matters though - it is probably most important that it is just somewhere different from what I already know. I wanted to travel - actually I felt I had to. When I went travelling in the Canary Islands I missed my bike too much - walking around can be very tedious. So I decided to travel by bicycle. I’m looking for happiness. I think that is ultimately what it is all about. Therefore, I’m exploring different ways of living, and different places, to see what could make me happy and the world a better place. I think I can inspire people and help them to be happier. I suspect most people have ideas about how to have a better life but they just don’t do it. Hopefully I can show that something apparently difficult, like cycling a long way, is actually easily achievable, so more people will do what they know they want to anyway. Maybe I can learn things about happiness that I can pass on. Rather than providing some fixed solution though, which is not likely to work for anyone but me, getting people to think and improve their situation rather than accept what is given would be an excellent result. Happiness and love are contagious.